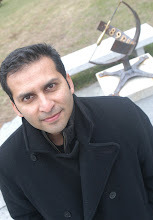 George Saliba's lecture at Hampshire College went very well, and I will post the video as soon as its available (most likely by the end of the month). Over dinner conversation, one thing really stood out for me and I thought I'll post it here. He was of the opinion that since European Renaissance was defined (and articulated) by humanists and not by scientists, it painted a skewed picture of scientific development of that era. From the literature perspective, Homer is as enjoyable today as he was in the 14th century, and as it was the case amongst the pre-Socratic Greeks. However, sciences don't work that way. As a scientist, you don't really care about some document if it was written a thousand years back. New instruments, observations, and models far superseded scientific texts written by the Greeko-Roman scientists over a thousand years ago. Thus there was a fundamental difference in how humanists were looking at the Greek culture and what scientists were doing. For example, European astronomers, up until the 15th/16th century, were looking for latest developments wherever they could find - and that was mostly in the Islamic lands. Of course, this demand diminished after the 16th century with the thorough maturation of science in Europe. Humanists of the Renaissance period, in fact, often criticized scientists for adulterating Classical knowledge with Arabic/Islamic influences. Thus, the standard narrative of the Renaissance paints an erroneous picture that the Islamic interlude was merely a vessel for preserving and then passing out ancient Greeko-Roman science to the Europeans. Instead, there is no such thing as preserved Greek science. It had been thoroughly transformed during the intervening centuries and it was the new science that was of any use, not some preserved version of it. This may be common knowledge, but I think this distinction between humanists and scientists is really interesting. 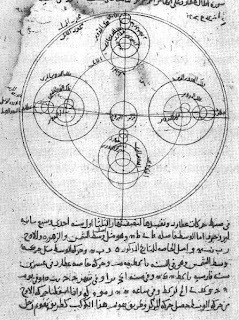 It was included in his lecture, but here is a planetary model of Ibn-al-Shatir from 14th century. It is mathematically equivalent to the one used by Copernicus, nearly 200 years la ter. Of course, Shatir's model is still geocentric, but it eliminated the pesky problem of the equant. The genius of Copernicus did the rest as he took the gigantic step of removing the Earth from the center. Was Copernicus aware of Shatir's model or is it a coincidence that he used a very similar system? Ah...its not clear, but thats where (intellectual) fights break out. For Saliba's take on it, you can wait for the lecture video, or you can read his Islamic Science and the Making of the European Renaissance.